Comet ISON comes in from the bottom right and moves out toward the upper right, getting fainter and fainter, in this time-lapse image from the ESA/NASA Solar and Heliospheric Observatory on Nov. 28, 2013. The image of the sun at the center is from NASA's Solar Dynamics Observatory. The celestial saga continues for Comet ISON, which crept close to the sun like the fabled Icarus, only to apparently survive the encounter at first. But whether the comet will once again be visible to stargazers is far from certain. On Thanksgiving Day (Nov. 28), many amateur and professional astronomers declared that Comet ISON was dead after the comet flew within 684,000 miles (1.1 million km) of the sun. But on Friday, to paraphrase Mark Twain: "The report of Comet ISON's death was an exaggeration." 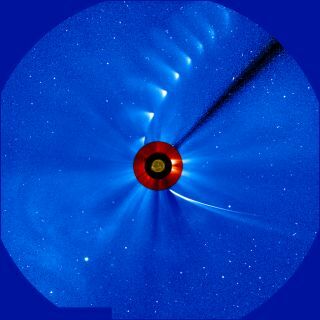 Comet ISON (or perhaps a large fragment of it) appeareddistinctly on images from the Solar and Heliospheric Observatory (SOHO) spacecraft hovering above the sun. But the long tail that was evident as the comet was en route to the sun, apparently dissipated as ISON buzzed the sun’s surface, whipping around the solar furnace at a speed of 843,000 mph (1.3 million km/hour). By Saturday (Nov. 30), the lingering fragment appeared to have become nothing more than a diffuse cloud, perhaps truly signaling the end for Comet ISON. "There's no doubt that the comet shrank in size considerably as it rounded the sun and there's no doubt that something made it out on the other side to shoot back into space," NASA officials wrote in an update Monday (Dec. 2). "The question remains as to whether the bright spot seen moving away from the sun was simply debris, or whether a small nucleus of the original ball of ice was still there. Regardless, it is likely that it is now only dust." A sketch of the Great Southern Comet of January 1887. Could Comet ISON become a "headless wonder"
If Comet ISON does reappear in the morning sky, would it still maintain some sort of a head or coma, or more likely just a tail? If it's the latter, then perhaps we will see something akin to the "Great Southern Comet of January 1887." This sungrazing comet was described as a faint narrow ribbon of light which contracted near the sun but with no trace of a head or condensation. Perhaps ISON will replicate that particular comet apparition in the days to come. Any sort of comet tail associated with what is left of ISON that might appear in the coming mornings would appear to stretch upward from the horizon and tilted to the left. However, comet expert Karl Battams suspects the amazing display scientists had hoped for won't be realized. "We still don't know if it will be naked-eye [visible] but based on its current brightness in the LASCO images — which is around magnitude +5 and fading — it does seem unlikely that there will be much to see in the night sky," Battams wrote in ablog post on NASA's Comet ISON Observing Campaign website. I suspect that some of the outstanding astrophotographers around the world will be able to get something, but I doubt it will be as spectacular as before perihelion. I hope I'm wrong though." "I'd guess that a few observers will begin picking up ISON in a couple of days, but if - and I do mean IF — Comet ISON becomes naked-eye visible, it won't be until near the end of next week (say, Dec 6 or 7). Please don't get your hopes up, but we all need to keep in mind how ISON keeps surprising us," Battams added. This NASA graphic shows the possible location of Comet ISON in the December night sky if the comet has survived its close sun encounter enough to be visible to the naked eye. In the table accompanying this guide, I have provided details for making a sighting of Comet ISON. The information have been calculated for an observer at 40 degrees north latitude and 90 degrees west longitude, near the population center of the contiguous United States. However, you need not live near Lebanon, Kansas, to use the table. A simple correction will allow you to get a more accurate time for most north temperate latitudes. If your longitude is on or very close to one these (such as in Philadelphia or Denver) no correction is needed. Otherwise, to get standard time add 4 minutes for each degree you are west of your standard meridian or subtract 4 minutes for each degree you are east of it. New York, for instance, is one degree east of the 75 degrees standard meridian, so you would need to subtract 4 minutes. But Indianapolis is 11 degrees west of the 75 degrees standard meridian, so there you need to add 44 minutes. Your clenched fist held at arm's length measures approximately 10 degrees from one end to the other. This table lists possible sighting opportunities for Comet ISON, if it is becomes visible to the naked eye after its Nov. 28 sun encounter, in December 2013. Column 1 provides the date. Column 3 gives that point on the horizon where the head of the comet is due to rise. Bear in mind that if there is a tail, that it will already be above the horizon. Column 5 provides the direction where the comet head will be positioned at the start of nautical twilight. The eastern sky will already be getting light, but it will be only early twilight and it will still be sufficiently dark enough to see a number of stars (and hopefully ISON). No times are provided for Dec. 1 and 2, since the head of the comet – or least where the head is supposed to be – will not have risen. Column 6 gives the comet’s altitude above the horizon when nautical twilight begins and finally, Column 7 is the time of sunrise. In terms of a timeline, in a few days we'll likely be able to make a good call on the naked eye visibility of ISON (As Battams urges: "keep your expectations low, please …). As it stands now, however … this is sounding more like an obituary (or maybe an "orbit-tuary"). Editor's note: If you snap an amazing picture of Comet ISON (if it has truly survived) or any other night sky view that you'd like to share for a possible story or image gallery, send photos, comments and your name and location to managing editor Tariq Malik at spacephotos@space.com.